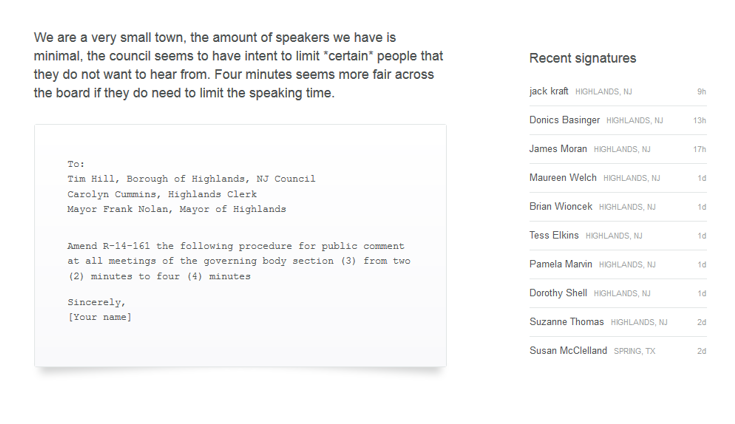 On June 18th, Mayor Nolan introduced R-14-161, which limits resident speaking time to 2 minutes. Further, it instructs the Governing body members to not respond to the questions of the resident until that resident has finished speaking in his/her entirety. There was a subsequent blog post here. it was placed on the table next to the public comment sign-in sheet – which many of those attending did not realize was supposed to be part of the agenda. There now is an online petition at Change.org that asks for support not to abolish the ordinance but to amend it to increase the speaking time from 2 min to 4 min as a reasonable alternative to this tactic of retribution by the council. How does it work? 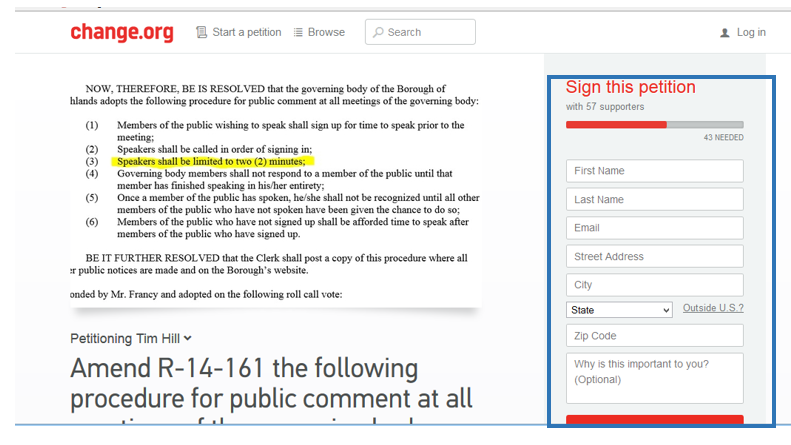 You go to the Change.org page and sign in, name email address and why you agree with amending the existing ordinance. Each person that signs it a notification goes to the petitioners. In this case its Mayor Nolan, Tim Hill and Carolyn Cummins. On the right hand side it will show recent signatures and below the petition it shows the reasons people are signing. Why online petitions can work: Governments, companies and individuals normally value their reputations and feel accountable to their neighbors, constituents and customers. When hundreds or even thousands of people raise their voices about an issue they care about, the message is very hard to ignore. According to Change.org, Successful petitions ask for something very specific, that a decision maker can change. They usually propose a sensible solution to a problem. i.e. a compromise to an existing ordinance asking it to be amended. Someday you may have an issue important to you that you may want to express on record and if your not a fast talker you can forget about it. It’s also about making sure what you say is on public record so there is accountability. Thus is a huge public interest issue even the state recognizes this as there is legislation in the pipeline but we all know how that moves at a snails pace. I thought this was instituted because the council didn’t want people taking up too much time and the meetings were running very late. That does not work for a number of reasons. First, there are occasions when the executive session runs past 8pm. It hasn’t happened as often recently as it has in the past but it still happens. That pushes the regular meeting later. Second, while a resident does get two minutes to speak, frequently the council will engage that person in a Q&A thereby extending their time. Third, if a person is uses their two minutes and is cut off, the council can ask them, “What else did you want to say?” thereby giving some people more time than others. This is a flawed resolution and needs to go. I fully support the change to four minutes, but I truly believe this resolution creates more problems than it solves. Especially after residents are being told that this was in retaliation for their active participation at the meetings. Gee hb, the pricelessness of your response to my rather whimsical post has me reevaluating your literary prowess. And to imagine, I used to think you were intelligently challenged. Oooh boy that hurt… Is that best retort you can come up with? II expected more from you. When you have some additional time google Monty python “holy grail” because trying to have any type of intellectual conversation with you reminds me of Monty Python skits for some reason. I thought my reply rather sophisticated sarcasm…..probably beyond your ken……I did not watch the Monty Python show, but I understand that Monty Python and the Holy Grail was a top box office hit in the UK, so I guess I can take your rather ill phrased “retort” as a compliment. Oh come on lady… that’s the best you got? Please… I guess senility is really setting in with you.. If the town had leaders like Lincoln, we probably wouldn’t have this problem. Nuf said. “If I were to try to read, much less answer, all the attacks made on me, this shop might as well be closed for any other business. I do the very best I know how–the very best I can; and I mean to keep doing so until the end. If the end brings me out all right, what’s said against me won’t amount to anything. If the end brings me out wrong, ten angels swearing I was right would make no difference”. quote by Lincoln. So, you see, John, even Lincoln had his distracters. He would have been “meat” for the naysayers. Why, yes, Cave, all politicians have their detractors (Im pretty sure that is what you meant)but, we cant compare a president who brought together a divided nation with a council and mayor…..well who knows what they have done. You are correct, there will always be people who are not happy unless they have something to complain about. But in the forums of discussion, whether it be here, facebook, town hall meetings or at the coffee shop, the majority are unhappy. So if things changed in the town, perhaps the majority of bell aching would stop. You seem to be leading that pack. Once again you’re comments fail to include anything positive. Why is that? Why do you even care whether the speaking time is 2 minutes or 4 minutes? It’s not like you attend the meetings. I liked Lucille’s point about Lincoln & the Gettysburg address …. and it got me thinking … What would have not been heard if this was delivered at a Highlands Council meeting under the new 2 minute rule? “That this nation, under God, shall have a new birth of freedom – and the government of the people, by the people, for the people, shall not perish from the earth”. The audience was so enthralled by Lincoln’s words, that they didn’t even notice the extra 1/2 minute…..now, perhaps if the petitioners to our Council could confine themselves to 2 & 1/2 minutes and be adequately prepared, I’m sure they could slip that extra 1/2 minute in without notice. I wish that were true Lucille … but it’s up to the subjective opinion of the one holding the gavel as to how rigid that 2 minute rule is enforced. Actually, it’s up to Carolyn Cummins or Bruce Padula. They’re the ones with the timer. Like another blogger mentioned, Bat cave still has nothing positive to add just bellyaching about people wanting the opportunity to express themselves again. Blah blah blah! Well, you know what they say, “”The best defense is a good offense” – when the majority of Highlanders want change and a “better Highlands”, those people that feel remotely responsible, even subliminally for its mismanagement, will go on the offense and claim, us naysayers are mean bullies that are setting our expectations of a transparent effect government, as having way too high expectations. There are processes you know and we’re all just not smart enough to know what those processes mean. How DARE we expect to actually fix things. Tell me, Elaine B, do you call that a “positive” statement? Is that what you aspire to? Is that what you call expressing yourself? STILL no positivity just being wisenheimer and playing people against each other. That I will not indulge you in! Didn’t someone promise to go away last time? And the time before? Just like campaign promises. Totally meaningless. If there’s a limit on how long the public can speak, perhaps we can put some time frames on how long the mayor and council can take to respond to an email request/question. I really don’t understand how the nay-sayers like Lucille expect interaction with the council (hint: they don’t want any because us taxpayers and civilians are stoopid). We are dissuaded from asking questions in public comments in meetings. Emails sent to their publicly available Highlands email addresses on the web page seem to disappear into thin air. Committees don’t meet, despite requests to do so. Requests to join appropriate committees disappear into the ether. Questions on Facebook get crickets unless someone has a horn to toot or an election to campaign for. Too bad we don’t give up that easily. I say give Lincoln more than 2 minutes and repeat after me …. OF THE PEOPLE, BY THE PEOPLE, AND FOR THE PEOPLE …. now replace “PEOPLE” with “TAXPAYERS”. Nah…..it would cause Lincoln’s immortal words to lose some of their cachet……then again, maybe my history teacher wouldn’t have made me memorize it. OK KANE FAMILY: CHALLENGE: How do we get everybody old, new, hill, low level to work together to move Highalnds foward. Thing we have in common, we love Highlands. We need to throw the BS to the side and figure out how to work together. I’m willing to compromise.. are you? Ok, hang on everyone. We are a small town with issues. There must be a way we can sort out our problems without going to the dark side. Let’s see what we can do to help people one by one, that will help all of us in the end. Stay strong and let’s focus on what really matters in the end. I think we should give heed to Carolyn’s words of reason. Fact and reasoning should be applied to any situation. Reciprocity, being treated in kind, should be a goal toward better working relationships. As history professor James Harvey Robinson stated, “Most of our so called reasoning consists in finding arguments for going on believing as we already do”.